Yogoda Satsanga Society of India (YSS) was founded by Sri Sri Paramahansa Yogananda in 1917. Yogoda Satsanga Math at Dakshineswar serves as the registered headquarters of YSS. The history of the YSS ashram at Dakshineswar dates back to 1939, when the Math was established. 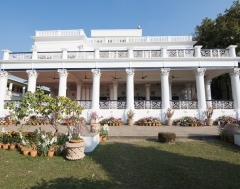 The property at Dakshineswar with its stately building and serene surroundings was much cherished by Paramahansaji. In 1951, while addressing a large group of audience during the Self-Realization Fellowship Convocation, in America, he envisioned that Dakshineswar ashram will be visited by the devotees from India and all over the world. Dakshineswar is a place located in the north of Kolkata, along the eastern banks of the Hooghly river- as the Ganges river is known around these areas. Spread over two acres of land and having a fruit orchard, flowering plants, a big pond and stables, the ashram was originally a ‘garden house’. Keeping Paramahansaji’s vision for the ashram in mind, a guest house, kitchen, working and dining areas were built within the premises for the convenience of devotees. The ashram has been blessed by the sacred presence of our beloved late President Sri Sri Daya Mataji during her many visits to India. Daya Mataji had conducted many satsangas, meditations and counselling sessions with several devotees here. The ashram also had the privilege of having the presence of our beloved President Sri Sri Mrinalini Mataji, who had accompanied Daya Mataji’s during her visits to India. Daily group meditations are conducted at the ashram every morning and evening. All are welcome to attend these meditations and the Sunday satsanga. All YSS/SRF devotees are welcome to visit the ashram and participate in individual as well as the conducted group retreats. The conducted retreats usually include three days of silence, morning and evening practice of Energization Exercises and group meditations, review of the meditation techniques and classes on the teachings of Yoganandaji. Please book your stay for these retreats in advance. 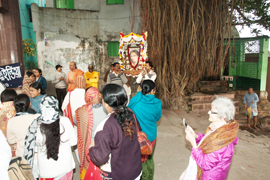 Devotees arriving in Kolkata for other personal or business purposes are advised to stay outside the ashram, though they are welcome to visit the ashram or attend a retreat after completing their business assignments. 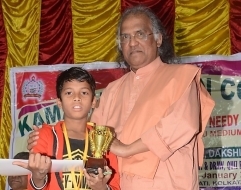 Dakshineswar ashram is involved in several educational, medical and other charitable activities with an aim to help the people with limited financial means. The activities include running several homeopathic and allopathic clinics, pathology labs, schools and colleges in and around Kolkata. 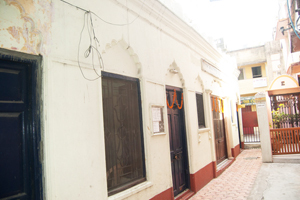 Yoganandaji’s home at 4 Garpar Road is one of the important places in Kolkata visited by the devotees. The second floor attic room was his sacred cave, where he put forth tremendous effort in his early years of spiritual sadhana, and had many of his ecstatic experiences and visions. As a young lad wanting to run away to the Himalayas in search of God, it was from this room’s window that he had thrown down a small bundle.It was also here (after meeting the angelic Master Mahasaya), that he had a vision of Divine Mother appearing before him and giving him Her loving assurance, “Always have I loved thee! Ever shall I love thee! In one of the rooms on the first floor of the building, Yoganandaji had a darshan of blessed Babaji. 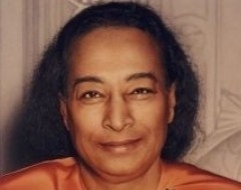 On July 25, 1920, before leaving for America, Yoganandaji prayed with tremendous intensity seeking the divine protection during his forthcoming visit to the West which was steeped in materialism. It was then that Mahavatar Babaji visited Yoganandaji, blessed him and assured him: ”You are the one I have chosen to spread the message of Kriya Yoga in the West”. This day is celebrated by YSS/SRF devotees all over the world, as Babaji Smriti Divas. This room also contains some old family photographs and other quaint collections. At present, the place is a residence of the descendants of his brother Sri Sananda Lal Ghosh, who have maintained it well and are courteous and welcoming to the visiting devotees. YSS has a meditation center at Pitambar Bhattacharya Lane in Garpar Road area where many local devotees meet regularly. This place is adjacent to the house of Yoganandaji’s childhood friend, Tulsi Narayan Bose and is where Yoganandaji had meditated with his friends as a youth. Group meditations and satsangas are conducted here every Saturday between 4.00 pm - 7.30 pm. A nearby place of interest is 50 Amherst Street, the residence of Sri Master Mahasaya (an exalted disciple of Sri Ramakrishna Paramahansa) which Yoganandaji often visited in his early years. It had earlier been the house where Yoganandaji’s mother had passed away. Originally the place where Bhaduri Mahasaya (The Levitating Saint) stayed on Rammohan Roy Road is also open to devotees. 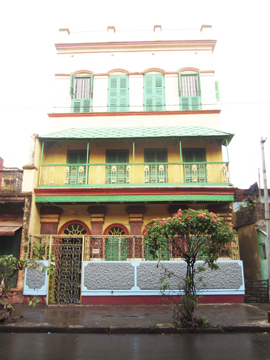 Sri Yukteswarji’s hermitage at Buro Bibi Lane in Serampore is about 20 Kms from Dakshineswar. It was here that Yoganandaji spent most of his time during his college years. In the honor of Swami Sri Yukteswarji, a Smriti Mandir has been constructed within the hermitage premises. Very close from here is the house of Yoganandaji’s uncle Sri Sarada Prasad Ghosh, where Yoganandaji stayed for some time. 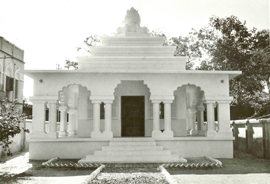 Yoganandaji’s cousin, Sri Prabhas Chandra Ghosh, son of Sri Sarada Prasad Ghosh, converted the room inhabited by Yoganandaji into a shrine named Anandalok. On the banks of the Ganges at Rai Ghat lane, still stands the large banyan tree, a silent witness to the meeting of the celestial Babaji and Sri Yukteswarji after the latter completed writing his book ‘The Holy Science’ undertaken at the behest of Babaji. Only a few hundred meters from Rai Ghat lane is the plot which was once the Panthi boarding house in which Yoganandaji lived during his college years. The old structure, being in a dilapidated state, has been demolished now by the local council. 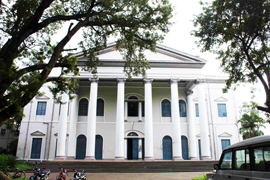 Not far from this place is Serampore College, in which Yoganandaji was among the first students to enrol for the Bachelor of Arts course and receive his A.B. degree. The college, being one of the oldest educational institutes in the country, is still serving the society on a greater scale. 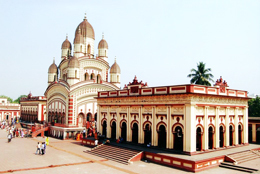 About a kilometre away from the Dakshineswar ashram is the world famous Kali temple. Dakshineswar is famous for the nine domed temple of Ma Kali as Bhavatarini, standing on the chest of a lying Shiva. This temple houses the beautiful figures of the Divine Mother and Lord Shiva on a painstakingly chiselled thousand petaled silver lotus. In his autobiography, Yoganandaji describes his many pilgrimages to this temple. It was within the precincts of this temple that he had an ecstatic vision when he was visiting with his sister Roma and her husband Satish. The latter, an atheist was transformed into a silent saint by Yoganandaji’s prayers to the Divine Mother. Yoganandaji’s love for God in the aspect of the Merciful Mother took him often to this temple where he meditated for many hours in the portico, in Sri Ramakrishna Paramahansaji’s room, and also under the Banyan tree in the Panchvati, where Sri Ramakrishna Paramahansa had received illumination. The sacred room in the temple premises where Sri Ramakrishna stayed for the last 14 years of his life is preserved as a shrine where devotees can meditate and also see the display of several articles used by him.